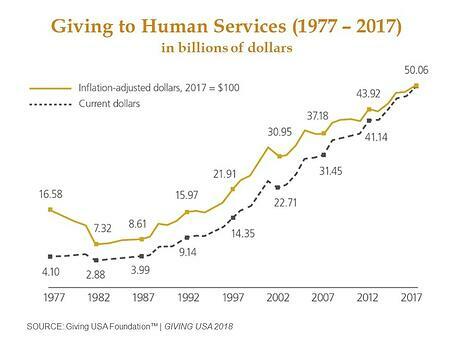 Giving USA estimates that giving to human services organizations increased 5.1 percent in 2017, to $50.06 billion. This record total amounted to 12 percent of total giving across subsectors, behind only religion and education. Sixteen natural disasters during 2017—at a cost of at least $1 billion apiece—prompted a widespread outpouring of donations to human services organizations. Some innovative organizations employed new avenues of getting aid to victims, including direct cash giving and crowdfunding options. Nonprofits in the human services sector continue to be concerned about the future of federal funding, and leaders are increasingly looking to secure philanthropic funds to sustain their operations. Of particular note are cuts to federal housing programs and the Supplemental Nutrition Assistance Program (SNAP). Organizations are using innovative approaches to combat hunger and food insecurity, including online delivery services and the ability to use SNAP benefits as payment. Nonprofit partnerships with food retailers are helping to fulfill needs more efficiently than in the past. Stay abreast of proposed federal budget changes. A new survey of human services organizations and government agencies reports that 70 percent of funding for direct program expenses comes from federal aid. As organizations see these funds continue to decline, it becomes even more important to focus on major gift efforts to sustain operations and programs. Individuals continue to be the largest source of contributions across all sectors. Building and maintaining relationships with individual donors cannot be emphasized enough—it must be a continual focus. Promote the importance of regular support and encourage online giving. Two key reports on online giving by Blackbaud and The Chronicle for Philanthropy report that online giving for human services organizations increased in 2017, particularly in regard to regular monthly donations. Make it easy for donors to make recurring donations by featuring a recurring giving option on your web page and recognizing sustaining supporters with a one-time acknowledgement or member benefit. Increase the steady stream of donations by asking new or existing donors to structure their gifts in this way and consider asking recurring donors to upgrade their gifts from time to time. Consider creative options for service delivery. Is there a different way to provide the services your clients need? Organizations that provide food are thinking outside the box and using partnerships and technological advances to solve delivery issues, which can positively impact efficiency and costs. One organization began using an app and website in 2017 that allows low-income families to order food kits online. Partnerships with retailers such as Amazon’s Fresh and Fresh Direct are providing food to people in need. Investing in innovation could be worth the cost in the long run, taking the pressure off fundraising efforts. Visibility matters. In spite of the plethora of natural disasters in 2017 that attracted overwhelming support from traditional and non-traditional donors, human service organizations received substantial gifts during the year. Causes such as homelessness attracted multi-million-dollar gifts to support new shelters and services in cities like Seattle and and San Diego. With multiple competing philanthropic priorities, ensure that your organization is highly visible in your donor market and that your message is clear and well-defined.